The Iuventa of the NGO Jugend Rettet rescues several migrants in distress during the Easter weekend 2017. Due to continuing inadequacy of state rescue operations, NGOs present in the area are often working at the limit of their capacities. Credit: Moonbird Airborne Operation / www.sea-watch.org, www.hpi.swissIt has been spreading like a trail of powder. A heinous argument blaming rescue efforts in the Mediterranean for colluding with smugglers, encouraging more migrants to attempt the perilous sea crossing and ultimately endangering their lives, has, over the past few months, broken out of the small circles of far-right conspiracy theories to reach the headlines of prominent newspapers and become the official position of European states and institutions. The latest proposal by the Italian government to block its ports to nongovernmental rescue vessels and the subsequent EU-endorsed plan to impose a code of conduct to limit their activities are only the most recent outcomes of months of virulent attacks. These proposals disturbingly converge with the initiative of far-right groups which are chartering their own vessel to stop NGOs at sea. Should these different initiatives succeed in blocking or hindering rescue efforts, the consequences for migrants would be disastrous. The accusation that rescue efforts would be the cause of the soaring numbers of crossings and deaths at sea is far from new. Already in 2014, the Italian military-humanitarian Mare Nostrum operation, which had for a year deployed unprecedented means to rescue migrants at sea, was accused of constituting a “pull-factor” that endangered migrants’ lives. The termination of Mare Nostrum, however, did not lead to less crossings, only to a staggering rise in the number of deaths at sea. It was precisely to fill the lethal gap in rescue capabilities left by the EU and its member states that NGOs courageously stepped in with their own vessels. During recent months, they have repeatedly given proof of their fundamental life-saving role, often operating at the limit of their capacities to make up for the lack of state rescue means. Despite this, it is their activities which are today threatened by a campaign of criminalisation and de-legitimisation. While the most heinous accusations of collusion with the smugglers have been revealed to be baseless and receded from mainstream discourse, a subtler but no less grave accusation initially formulated by Frontex, the European Union border and coast guard agency, and reminiscent of that formulated against Mare Nostrum, has proven remarkably resilient. A recent article by the New York Times titled “Efforts to Rescue Migrants Caused Deadly, Unexpected Consequences” offers the latest example of this argument. After showing through data visualisation and cartography that in the past few years rescue operations have moved closer to Libyan coasts, the NYT authors uncritically voice the concerns raised by Frontex that this shift would have “introduced a deadly incentive for more migrants to risk the journey and for smugglers to launch more boats”. They also claim that the presence of rescue vessels would have encouraged smugglers to use even more dangerous tactics, such as using “flimsy boats and provide just enough fuel to reach the edge of Libyan waters”. In sum, while admitting that “rescuing migrants closer to the Libyan coast saved hundreds of people at sea”, the article casts a dark shadow over rescue efforts in the Mediterranean, claiming that, despite themselves, “strategies to rescue migrants in the Mediterranean Sea […] have pushed desperate migrants into even more desperate situations”. With a cunning sleight of hand, the rescuers are turned here into the culprits for the growing numbers of deaths at sea. 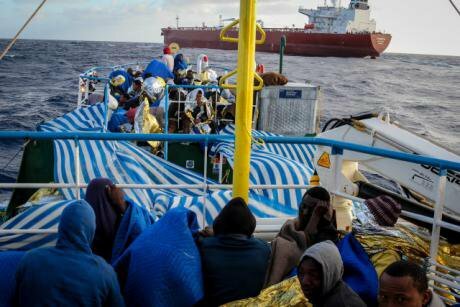 Rescued migrants on the deck of the Iuventa of the NGO Jugend Rettet during the Easter weekend 2017. Despite a nominal capacity of no more than 100 people, the Iuventa had to take on board hundreds of people to make up for the absence of state-led rescue assets. Credit: Giulia BertoluzziAs humanitarian actors know all too well, they must always confront the possibility that their intervention may unwillingly amplify the problem they set out to alleviate. But today, there is solid evidence that these arguments are fundamentally mistaken and that rehearsing them uncritically only contributes to legitimising a dangerous policy. As we have demonstrated in a recently published report, rescue efforts were not the main driver of increasing arrivals over 2016. Data collected by Frontex itself provides evidence that the overall increase during that year was mainly due to more crossings by migrants from several West and Central African nationalities which predated the deployment of NGO vessels. Furthermore, a 46% increase in the number of arrivals was registered in the western Mediterranean for 2016, while no proactive rescue operation was deployed in that area. Faced with political and economic crises in several countries on the African continent and with appalling conditions in Libya, migrants have little choice but to attempt the sea crossing, with or without resuce means. We also demonstrate that rescue efforts by NGOs were not the main cause of worsening conditions of crossing but a life-saving response to evolving smuggling practices that predated their intervention. 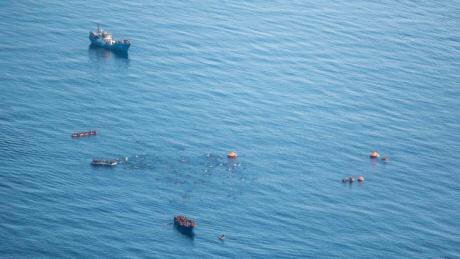 For instance, the shift from larger and more solid wooden boats to rickety and smaller rubber boats, which has been acknowledged as a major factor in the increasing deaths at sea, occurred already in late 2015, when the presence of NGOs was still marginal. One of the most important factors leading to this trend was the EU’s anti-smuggling Operation Sophia, which, by destroying smugglers’ vessels once migrants had been rescued, prevented the re-use of wooden boats. Another crucial factor has been the increasing attempts by the Libyan Coast Guard to (selectively) intercept migrant boats. These and other factors converged to push even further the downward spiral in the conditions of crossing offered by smugglers. While it cannot be ruled out that NGO rescue efforts contributed to consolidate specific tactical shifts in the practices of smugglers, it is wrong, we show, to claim that they were driving them. 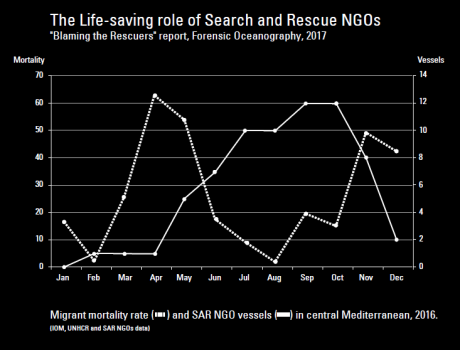 Finally, and most importantly, our statistical analysis indicates that there is a strong negative correlation between the migrant mortality rate and the deployment of NGOs’ rescue vessels. In short, over the course of 2016, the more NGO vessels were deployed, the safer the crossing became for migrants. This provides the strongest demonstration of the life-saving role played by rescue efforts and a forceful empirical rebuttal of their supposed “deadly consequences”. The ending of Mare Nostrum was recognised too late by Jean-Claude Juncker, President of the European Commission, as a “serious mistake” that “cost human lives”. Today EU institutions and members states are on a course to repeat this same “mistake”, with a wicked twist. This time they are not simply persisting in their resolve to not provide adequate rescue means in the aim of deterring migrants from crossing, but they are also actively seeking to stop those who made up for their lethal absence and continue to remind the EU of the unacceptable deaths at its shores. The only "rescue" activities European policy makers wish to see are those operated by the EU funded and equipped Libyan Coast Guard, regardless of the proven collusion of its agents with smugglers, the repeated deaths their intervention has caused and the horrendous conditions migrants face once pulled-back to Libya. This is the cynical and lethal policy of containment implemented today by the EU. 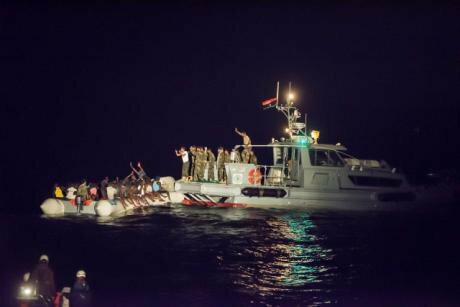 In the night of 21 October 2016, the Coast Guard of Zawiya, Libya, violently interrupted a rescue operation that had been started by the rescue vessel of the NGO Sea-Watch. This led to the death of at least 25 people. Credits: Christian Ditsch. NGOs themselves are acutely aware that rescue at sea cannot be the “solution” to the death of migrants in the Mediterranean. Only a fundamental shift towards policies enabling the passage of migrants through safe and legal means will bring an end to the daily reality of thousands of migrants in distress, and with it the need to rescue them. But as long as migrants are forced to resort to smugglers for lack of legal pathways, and while states continue to refuse to deploy their own proactive rescue operations, the presence of NGOs close to the Libyan coast will remain both a humanitarian necessity and a much-needed expression of the refusal to silently accept the ongoing carnage at sea.